Three foreigners, one Canadian (Kirsty), a Norwegian (Inga) and an American (Lia) met in Rwanda’s capital Kigali and after connecting, discovered an opportunity and grabbed it with two arms. They are operating a portal that provides handy information about “Living in Kigali” to expats and visitors to Rwanda. They figured, Uganda and Ethiopia offered the same opportunity. Guess what? They went for it too. If you are looking for where to hung out, eat out, a ride in town, health facilities and so on, the site indeed provides a whole lot of useful information. His colleague Inga writes on their website: “I fill my time trying out Kigali restaurants and clubs (probably shouldn’t use the plural form of that noun) and writing for Living in Kigali.” For some reason, the Norwegian does not have immediate plans of leaving Rwanda. One recent post on the portal mesmerized me. I thought, why not share the story. So, Kirsty makes a list of his favourite meals in Kigali and goes on to take a photo of each meal. I must warn you, please look at the pictures at your own risk. You might salivate your tongue out. 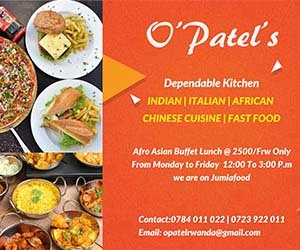 “Read on to see what I consider the best meals in Kigali and please be sure to let everyone know what you think in the comments and especially tip us off to any great meals that aren’t on my list,” he says..
All the details below are entirely his. Taarifa couldn’t have done a better job. Kudos Kirsty! Arabika has to be one of the most frustrating restaurants in Kigali with wait staff who pay almost no attention to you and food that comes out at different times and can take forever. But if you’re willing to look past those annoying things, I’d recommend arriving with some patience and ordering their babaganoush which, I think, is the best thing on their menu. The ‘pita’ could be better, but the dip itself more than makes up for the sub par flatbread. Also give their tabbouleh (Rwf 3,000) a try! 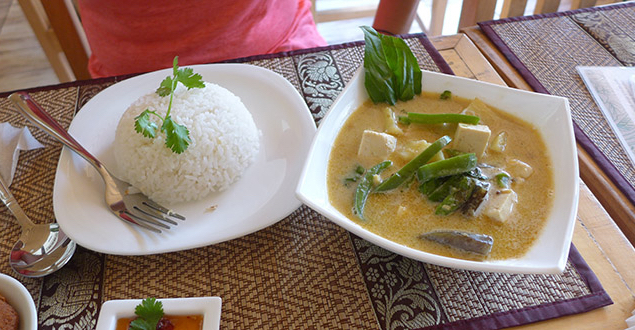 Asian Kitchen – Thai Green Chicken Curry (Rwf 5,500) Asian Kitchen is a relatively recent addition to Kigali’s list of restaurants and I only wish they found their way here sooner for us long-suffering fans of Thai food. You can find something resembling Thai green curry (in that they’re green) around town but they’re almost always too thick and the flavour is all-wrong. Asian Kitchen’s green curry is the best of the lot and I’d even go so far as to say it’s pretty authentic. The sauce is the proper runny consistency and they pack it full of meat and veggies. The restaurant itself is far from where I live so I usually enjoy this meal courtesy of Jumia Food and, so far, they’ve always managed to deliver on time and hot. I’d also highly recommend the Thai potato salad. While I can’t say I’ve ever encountered a potato salad in Thailand, this side dish is really delicious and a close second for my favourite dish at the restaurant. There are loads of Chinese restaurants in Kigali to choose from and it seems like everyone has their favourite. I’m partial to Great Wall (which moved last year) for an overall meal but I’m a total sucker for sweet and sour anything and I think Bamboo Rooftop does it the best. They’re generous with the pineapple and green pepper where many other restaurants (gasp!) don’t even include it. It’s the perfect amount of sauce and goes well with their chicken fried rice, which is also one of the best in Kigali. CasaKeza is a brand new place and they’ve been testing lots of different menu ideas so far, including some French and Moroccan days and they’ve also just introduced paella by pre-order. This lunch dish is something I ordered a couple of months ago and now it’s a regular on their current menu. This is great news as it’s a perfect way to sample a bunch of their dishes in a personal size for each, rather than having to order just a few of the larger tapas. Plus the gazpacho is really excellent and the bread (to dip in the delicious aioli) is a nice touch. Really high quality stuff and for the size it’s filling and good value. Not only is this one of my favourite meals in Kigali, it’s also one of the best value. Your Rwf 4,000 buys you an entire half chicken, a generous serving of fries, and a pretty sweet little side salad as an added bonus. The chicken is delicious. Super moist (ew, that word) with an amazing seasoning on the outside and crispy skin. It’s the kind of dish you just need to dive into using your hands, all savage-like. A very yummy, satisfying, and affordable dish and one of the only (the only?) places in town you can find proper rotisserie chicken. I think The Hut is a fantastic new addition to Kigali, mainly because of the menu filled with original options. The Lebanese lamb kofta is one such dish that can’t really be found anywhere else in town. It’s served with a fresh salad of avocado and tomato which also works as a nice topping. Add in the minty yoghurt dip and wrap it all up on the pita bread and you’ve got a tasty hotdog-like thing with Middle Eastern flavours. Ok so perhaps it’s a stretch to go to a place specifically just to have ibirayi (grilled potato) but I really really like how they’re done at Kaskito Pub and their brochettes are excellent too which makes it a fine place for a local meal in a nice setting. The ibirayi is perfectly grilled and then they add a dollop of delicious coleslaw type stuff on top which really makes the who potato-y experience a wonderful one. The Iriba Bar at The Marriott has some pretty impressive food at prices that are more affordable than you might think. Sure, Rwf 8,500 is on the more expensive end of the spectrum but it is the Marriott, after all, and I think they serve up food that’s worth the price. The fish and chips are one of my favourite things on the menu and the best I’ve found so far in Kigali. I’m not sure I’ve seen proper beer-battered fish anywhere else and they do it well here. Nice and crispy. The fries here are also tasty and overall it’s a dish that leaves me full and happy. Poivre Noir is one of the best restaurants in Kigali and, while I think everything they do is really great, the burgers are where they truly shine. Their gourmet burgers have huge, beefy, well-seasoned patties with a variety of toppings to choose from. I am a firm believer in pickles on burgers and Poivre Noir is one of the only places with proper dill pickles and the rest of their toppings are always fresh and heaped on in generous amounts. Add in an order of thick fries and you have a seriously tasty lunch. Turambe Shoppe is a newish place and great for healthy soup, salad, and sandwiches. I love a lot of things on their menu but my favourite is their Kale Chicken Caesar salad. It’s not a classic Caesar salad in that it has tomatoes on it but it’s the closest thing I’ve found in the city and the generous serving of real parmasan cheese, the crispy croutons, and the dressing really elevate this salad into something amazing. The Caesar dressing here is unreal (as are the other salad dressings they make which, I think, are available for sale for Rwf 300) and it makes this my favourite salad in Kigali by a long shot. Ah the humble tuna sandwich… it’s something that should be simple but Kigali restaurants have been getting it wrong for years. Usually due to a lack of mayonnaise or too much bread. Rz Manna got it right for awhile but then it seemed to be served exclusively on stale bread so I gave up after giving them many tries. Turambe Shoppe have a wonderful tuna sandwich but it’s more of a gourmet variety with things like grapes and apples in the mix. If you’re looking for a classic tuna sandwich (and I was, my friends!) then your sandwichy prayers have been answered by Ubumwe Grande. The mix is simple, the tuna serving is generous, and the bread manages to be both grilled and still soft for a really nice overall sandwich. This is an oldie but a goodie and I have no idea how Subzi Taka Tin (veggie balls) didn’t make my last list. This is one of my go to dishes in Kigali and one of the reasons I prefer Zaffraan to Khana Khazana who also have Subzi Taka Tin but don’t do it nearly as well. This dish is a great combination of spiciness and texture with the tender veggie balls mixing well with the crunchy onions and greet peppers. I like this dish with a bit of naan and mixed raita yogurt dip to cool it all down. Though it’s listed in the starters section, it’s large enough to be a main and that makes it very good value.